One of the first parts of the Illuminati network that new researchers discover is the group of organizations which connect into the British-based secret society called The Round Table. These include the Bilderberg Group, the Royal Institute of International Affairs, the Council on Foreign Relations, the Trilateral Commission, and the Club of Rome. This network is not the most powerful expression of the Illuminati. There are many more elite groups within it's web, but these "Round Table" organizations are a key part of its day to day manipulation of politics, banking, business, the military (especially NATO), "education", and so on. You can read about all this in great detail in my books, And The Truth Shall Set You Free and The Biggest Secret. But briefly, the network was created to advance through the 20th century and beyond the Illuminati agenda for the centralized control of Planet Earth. 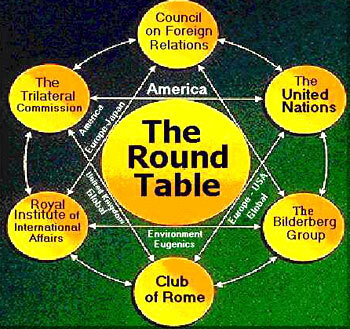 The Round Table was created in London (the Illuminati's operational centre) in the latter years of the 19th century. Its first official "leader" was Cecil Rhodes, the man who mercilessly manipulated Southern Africa and took those lands from the black peoples. Although, in theory, black people are back in political control of Africa, the real decisions are still made by the European and American elites via their black puppet presidents and leaders. Rhodes played tribe against tribe until they destroyed each other in war, so allowing Rhodes and the British to take over. The same is happening today in the continuing wars in Africa, details of which you will find on this site. Rhodes said the goal of the Round Table was to create World Government controlled by Britain (the Illuminati based in Britain). When he died in 1902, he left money in his will to fund "Rhodes Scholarships" in which overseas students had their expenses paid to study at Oxford University - the centre of the Illuminati's manipulation of "education". The ratio of these "Rhodes Scholars" who go back to their countries to enter positions of political, economic, and media power is enormous compared with the general student population. They act as Illuminati agents. The most famous Rhodes Scholar in the world today is Bill Clinton, the two-times President of the United States. But while Rhodes was the official front man for the Round Table, the real controllers and funders were, and are, the House of Rothschild, the banking dynasty which is at the heart of so much of the global conspiracy. This is not an anti-Jewish remark because the Rothschilds claim to be Jewish. The Rothschilds have manipulated Jewish people more than any other!! See Was a Hitler a Rothschild. As is provable with documentation, they worked together to engineer the circumstances that led to that global conflict. Through their technique of create-the-problem-then-offer-the-solution, they wanted to destroy the global status quo with that war and therefore have the opportunity to re-draw the world in their agenda's image when the conflict was over. This is precisely what they did. Power in the world was in far fewer hands after the war than before, and this was advanced even further when they engineered the Second World War also. This has continued to this day and, indeed, is getting quicker all the time. In 1919, came the Versailles Peace Conference near Paris when the elite of the Round Table from Britain and the United States, people like Alfred Milner, Edward Mandel House, and Bernard Baruch, were appointed to represent their countries at the meetings which decided how the world would be changed as a result of the war these same people had created. They decided to impose impossible reparations payments on Germany, so ensuring the collapse of the post-war Weimar Republic amid unbelievable economic collapse and thus create the very circumstances that brought Hitler (a Rothschild, see related article) to power. They also decided at Versailles that they now all supported the creation of a Jewish homeland in Palestine. 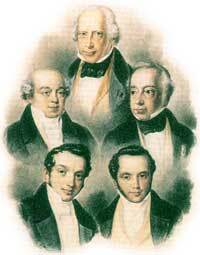 As I show in my books, EVERY ONE of them was either a Rothschild bloodline or was controlled by them. These are dominated by the Rothschilds and Rockefellers, and major manipulators like Henry Kissinger, who, in turn, answer to higher powers in the Illuminati. These organizations have among their number the top people in global politics, business, banking, military, media, "education" and so forth. These are the channels through which the same global policies are coordinated outside of public knowledge through apparently unconnected countries, political parties, and institutions. The upper levels of secret societies like the Freemasons, Knights of Malta, etc., connect into this Round Table web also.